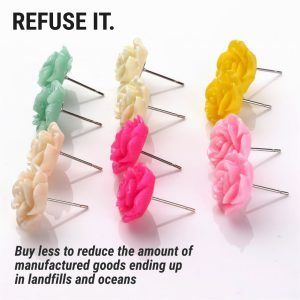 It is so easy to stock up on cheap earrings and jewellery made of plastic. We buy them without thinking and buy them for our children. But where will they end up when they are lost or thrown away? What was the environmental impact of their production? When you buy a gift for somebody or an accessory for yourself it is an opportunity to think of the impact on the Planet. If you buy a locally made product, you create work for a local person, and avoid air miles on the item. There are beautiful products made from recycled materials. You can buy products that are made from natural materials. Search for beautiful vintage jewellery. The ‘bargain’ label does not take into account the cost to the workers who were underpaid, the cost to the environment of the impact of that product, and the environmental impact of the air miles it took to bring it to you.